Japanese Journal of Monetary and Financial Economics, an official journal of Japan Society of Monetary Economics, publishes papers accepted upon review by referees. 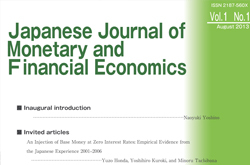 The journal accepts papers related to theoretical and empirical research on money and finance in accordance with the objectives of the Japan Society of Monetary Economics. More specifically, we accept papers on the following research topics: money, financial transactions, monetary policy, financial markets, financial institutions, financial industries, corporate finance, and international finance. The Society intends to share with the global academic community, the important Japanese experiences in the monetary and financial fields as well as to promote the academic research in the fields generally. Papers can be submitted by anyone. Copyright © 2012 Japan Society of Monetary Economics. ALL Rights Reserved.